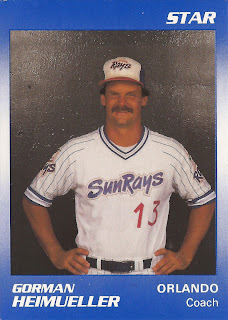 By 1993, Gorman Heimueller had made the majors as a player and turned that success into a minor league coaching career. To The Los Angeles Times that August, Heimueller, then the pitching coach of the AAA Portland Beavers, said he couldn't see himself do anything else. "I have my 20-year (high school) reunion coming up and I figure I should be the only guy there who hasn't had to work yet for a living," Heimueller told The Times. "Coaching is something I love doing. It's something that's in my blood. No matter how the day's going, once I put my uniform on, it's an escape for a few hours. I'm 12-years-old again." And Heimueller continued putting on that uniform into 2013, most recently serving as minor league pitching coordinator for the Phillies. Heimueller's career in baseball began in 1977, signed by the Giants as an amateur free agent out of Cal Poly San Luis Obispo. With the Giants, Heimueller started at single-A Cedar Rapids, moving to AA Waterbury for 1978, then seeing AAA Tacoma after a move to the Athletics in 1981. It was in 1983 that Heimueller made his debut in the majors. He got into 16 games for the Athletics that year, starting 14. He went 3-5, with a 4.41 ERA. That August, the left-hander pitched a gem, throwing a four-hit shutout against the Angels. Heimueller returned to the Athletics for another six outings, all in relief, in 1984. That marked the extent of his major league career. For 1985, Heimueller moved to the Twins system, playing that year at AA Orlando and the next at AAA Toledo. He then stayed with the Twins as he started his coaching career. Heimueller coached his first three seasons at single-A Visalia, moving to AA Orlando for 1990 and then AAA Portland for 1991. He stayed with the Twins through 1997, coaching his final three seasons at AA New Britain. With New Britain in 1995, Heimueller worked with a young Dan Serafini, focusing on maturity and steadfastness, according to The Hartford Courant. During a poor start that July, Heimueller tested the hurler, asking him he had had enough, The Courant wrote. Serafini wanted to stay. "I wanted to see his response," Heimueller told The Courant. "He's 21 years old, and in some ways, he's a big kid. We talk a lot about poise and composure. We tried to find something positive out of a negative situation." After a season in the Dodgers system, Heimueller arrived with the Phillies organization in 1999. He coached at AA Reading that year and in 2001, coaching at AAA Scranton in between. He then moved to the post of Phillies minor league pitching coordinator, which he stayed at through 2013. But he never made the majors as a coach. In 2009, Heimueller worked with a young Kyle Drabek, watching Drabek make the jump from single-A to AA. "He's a pitcher, with good stuff," Heimueller told The Reading Eagle that June. "Now he's getting an opportunity at a higher level. To me this is the biggest jump (for a pitcher) there is (in the minor leagues). You've got hitters that are more disciplined, they won't chase pitches as often. So it'll be a big challenge for him, but I think he'll be up for it."